The day was another hot one with temperatures in the low 40s until early evening. 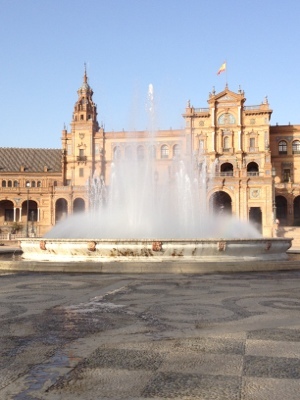 We decided to go to Sevilla, described as a gracious city and the regional capital of Andulusia. We were not disappointed. It was truly lovely with elegant houses, wide boulevards and spacious parks. As we didn’t arrive until the afternoon we only had time to do justice to the cathedral and the Real Alcazar. The cathedral was, until recently, the third largest in Christendom after St Peter’s in the Vatican and St Paul’s in London. 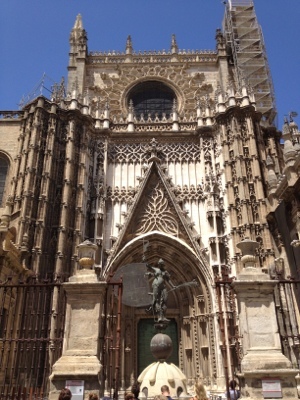 It also houses the remains of Christopher Columbus and has a magnificent organ that must be 30m tall. Next to the cathedral was the Real Alcazar palace and gardens are literally in another world going back to Moorish times. The gardens in particular with its follies and buildings were amazing and we didn’t do them justice in the time we had. To finish our visit we took a horse drawn tour around the old quarter visiting many beautiful buildings set in lovely surroundings. A far nicer way than a Hop On, Hop Off bus! To end the day we bought fried fish (they invented the fish takeaway long before the UK fish and chip shop) from a fish shop close to the marina where they have tables outside for you to eat your purchases and are open until midnight. We had ours on the back of the boat with fresh prawns and bread, all washed down with a local wine. Lovely. 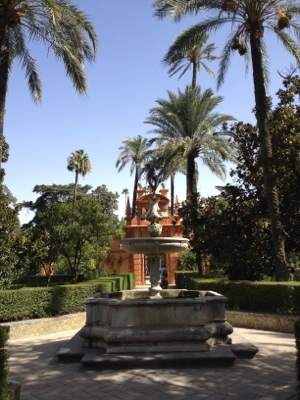 Photos below of the cathedral, Alcazar gardens and the Plaza de Espana.